My co-worker just sent me an update from a dog show over the weekend. 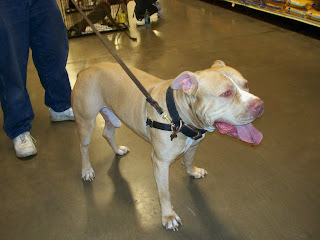 Valley of the Sun Dog Rescue was at the Pit-bull show and was the only rescue there. 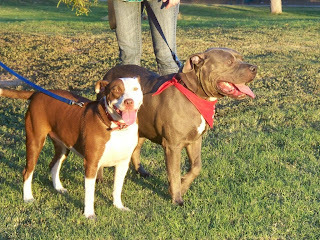 We wanted to represent the breed and show that rescue pit bulls can make wonderful pets too. Two of our pit bulls won ribbons. Loki (who is up for adoption) won a first place blue ribbon and Ditch ( one of our pit bulls that adopted to a loving home) won a third place ribbon. It was awesome to see so many Pits in one area and everyone did great. Those are the positive things that the media does not focus on with the breed. These 2 didn't win but they are Mia and Jax. This is Loki and he won a ribbon.